Following up last week's Down On The Street, neighborhood edition with another slow-moving chunk of German iron. 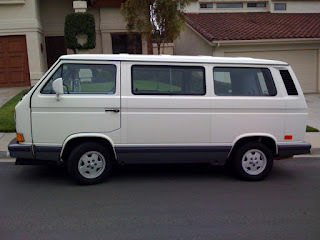 Easily mistaken for a washing machine sitting on the street is this 1991 VW Vanagon (aka T3) Carat. 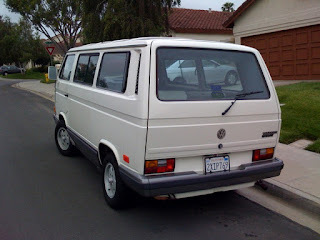 This was the last year for a rear-engined VW van, the layout having run it's course over a 41 year span. Allie and I really wanted one of these when we were first married, but at the time couldn't afford one. 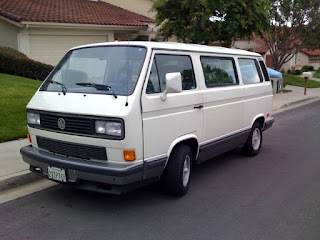 This example has the "Multivan" seating configuration that our EuroVan has. Two rear-facing jump seats, a table mounted to the driver's side in the passenger compartment and a rear seat that folds into a bed. Sure looks better than the VW/Dodge Routan ("Crouton"). 100x more character too.